Jumps, popping, Rotations, Kiteloops, unhooking, railies, mobes, inverts…. they are all on the wish list right? 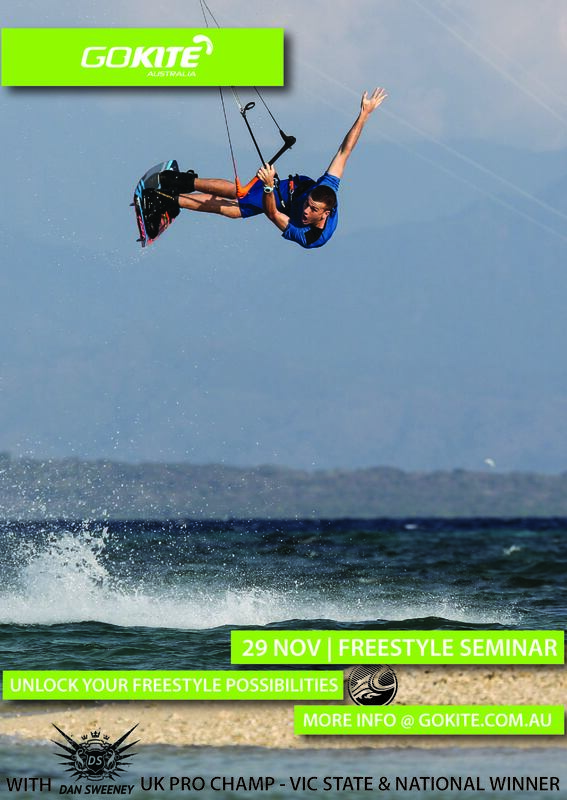 Well, you could be coached by one of the best male riders currently in Australia, Dan will be sure to take you to the next level in this Freestyle Seminar. Understand the technique and the stepping stones to nailing your next big move. There is no better way then to come along for the live demos, coaching, workshops topped with photo and video analysis session. No concepts here, all live learning. 2016 Cabrinha Products will be available for use during the Seminar. “I’m invested in your development and for you to learn the key distinctions between knowing HOW to execute a trick, but to actually find out what is holding you back. To consistently land and develop your progression in and around your current level.” Dan Sweeney. 10 spots available. Contact us at info@gokite.com.au or 0428 465 483 for more information and to book your place.